The Four Marks Lunch club for the over 60’s has been provided with funds by Alton Lions to purchase a range of new kitchen equipment to enable the preparation of wholesome quality lunches. The Lunch Club, an initiative by local residents Audrey McMillan and Michele Kuhn, was started just two months ago for people over 60 and provides a 2-course lunch with tea or coffee at £3.50 per person. The club meets every other Wednesday at 12:30 in the Village Hall and new members would be welcome. Transport can be arranged and booking is essential, contact Audrey 01420 564437 or Michele 0192 772159. 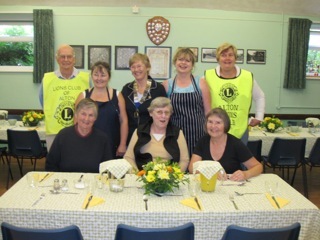 The Photo taken in the club dining room of the Village hall shows guest (front row) Jean, Jenny and Ann and (back row) Lion Keith Waterman, Audrey McMillan, Lion President Sarah O’ Donoghue, Michele Kuhn and Lion Jackie Barnes.